Chris King prides their bottom brackets on the steel sealed bearings which are authentically made in-house. The meticulous process of crafting the signature bearings ensures uncompromised durability and smoothness. The ingenious angular contact bearing design allows the bearings to adapt as they are broken in, to prevent elongated wearing. 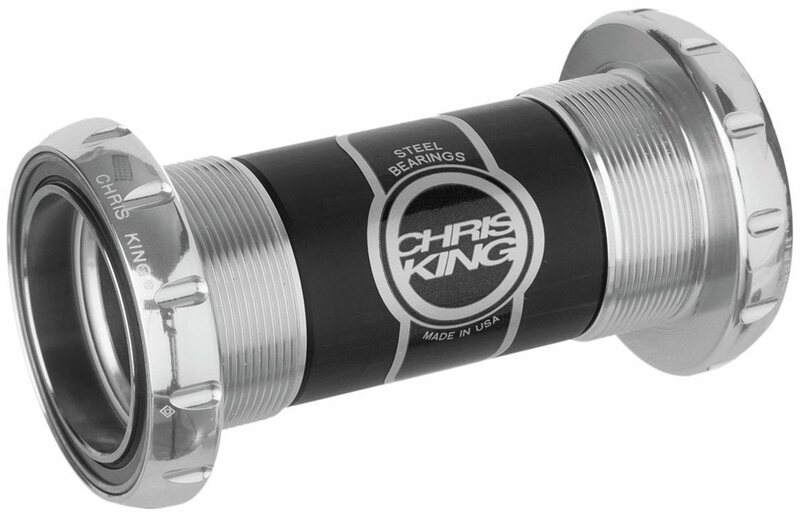 The Chris King Bottom Bracket is easy to reapply grease and flush, with the use of a Chris King injector tool (sold separately). Engineered, manufactured and assembled in Portland, Oregon USA. Easily serviceable with our integrated grease injection system. King $$$, King quality though. 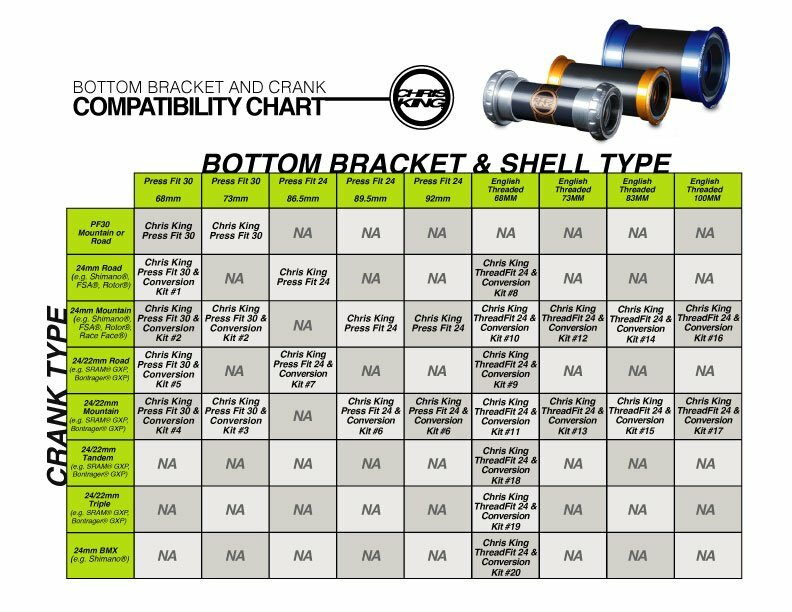 Leave some room in the budget because you will likely need a new tool to install the cups, and a separate fit kit is REQUIRED to install your specific flavor of crank. 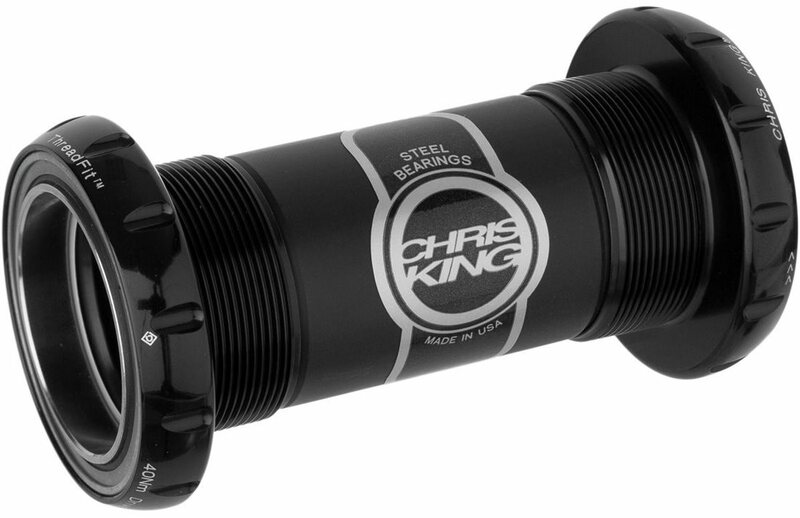 Building my latest dream required the best bottom bracket available, Chris King BB for the win! Jenson is great for purchasing items from Canada. Only issue I had was they were out of stock on conversion kit and tool. Nobody in Canada had it, so I had to order from one of Backcountry sites. Cost me more in shipping and fees than the parts cost and took over a week to ship. I had Jensons products in 3 days with no extra fees or bs. When it comes to a BB or headset I usually go with CK, the quality is unmatched, ease of install with provided cup tool and trouble usage for far longer than any other bb I've owned. The greasing tool is really nice as well do this frequently especially in wet winter. The greaser works on other BB as well so great up your friends BB while your at it! If I buy this bb, is that all I need to use with RaceFace turbine spindle and cranks? BEST ANSWER: No. One piece of the puzzle you will still need. There is a conversion kit needed to center the crank arms on the frame, otherwise the drive side crank arms (I think it’s that side) will rub the frame. The B.B. is not flawed, it just has a lot of different size frames to fit. Click the link below to go to the conversion kits. #’s 21, 22, 23, 24 is what you need to look at and order the one that applies. No way around it, and I searched long and hard to find anyone else that sells them at a lower price. I couldn't. I hope this helps. Happy Trails. BTW, I installed it last May. Except for retorqueing the crank arm after a few miles of riding, this bottom bracket is completely invisible. My favorite word to describe something that works so flawlessly you forget it’s there! No, you will also need a conversion kit, these can also be ordered through Jenson USA.. Either call Jenson support or check out the Chris King website to find out what kit is needed. one More thing to add. This BB And Conversion Kit we’re for a set of RF Turbine Cinch, direct mount cranks on a Salsa a la carte. The Chris King Conversion Kit #21 was needed with the 30mm dia. RaceFace spindle I had on my Santa Cruz Tallboy LT. I believe a CK conversion kit will still be required to face the bearings for preload. 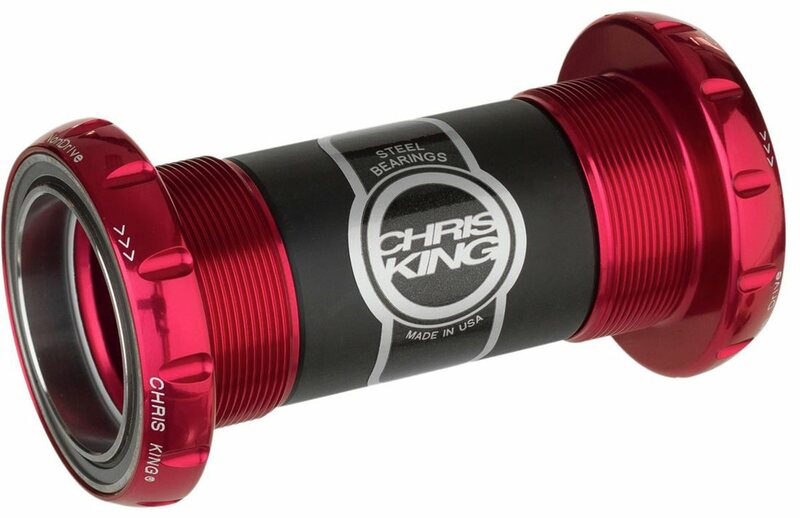 I don't understand about "facing the bearings for preload"
At the very least, you’ll need the y spindle sleeves supplied by CK for placement against the threadfit 30 bottom bracket so that you can preload the bearings. I believe kit 21 comes with a 2.5 mm spacer. You can also buy any bb30 spacer kit that allows you to dial in the cranks. When I say dial in, I mean centering the cranks in the bottom bracket shell and leaving enough play to preload the bearings. No, you’ll need the Chris King conversion kit #21. BEST ANSWER: So long as your frame takes a standard 73mm bb, should work fine. Will this work on an ibis mojo 3 with a RF Next sl crankset? Having my new Ibis Mojo 3 built up this week with CK ThreadFit-30 BB and RF Next SL cranks. I will let you know how it spins. Update: Was not able to use the CK Threadfit-30 BB. It will not clear the swing arm on my Ibis Mojo 3. The outside diameter on the BB shell is to big. Ended up installing a Rotor BSA30. Last edited by RSAmerica; 01-22-2017 at 11:19 AM." I would contact Chris King or Ibis and find out what they have to say.